G&B specialises in the mechanical design of piping & ducting, ie, piping stress analysis (speciality) & pipe/duct supports design, 3D/2D drafting, etc. These services are provided to the following industries: Petrochemical (offshore and onshore), chemical, power generation, nuclear, pharmaceutical, food, refrigeration, heating and ventilation, high rise office blocks, etc. Conceptual design development, design studies and design optimisation. Development of piping and instrument diagrams (P&ID’s). Development of detailed piping/ducting drawings (3D design & 2D drafting), including isometrics and supports. When required or specified, carry out piping/ducting detailed stress analysis calculations (expertise). Liaison with other disciplines: structural, equipment, process, management, H&S, etc., as well as with Lloyds Register and DnV. Estimation and the preparation of M.T.O., costing and schedule control. 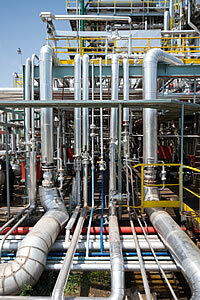 Problem Solutions (in design, commissioning and plant operation phases). 1. as part of the routine stress analysis calculations, or any independent other calc's: process operating and special conditions, wind loads and vibrations, seismic loads, blast loads, FPSO motion acceleration loads and associated multi-vector deck & structural displacements, effect of piping external loads on nozzles/shells, secondary & discontinuity stresses, fatigue assessment, creep and fatigue-creep effects, 'green water' and ocean wave slamming, 'Water hammer', pressure surges and mixed flow induced loads (slugs, etc. ), liquid sloshing effects, and	many	more. 2. PS's design calc's: derive ps loads by the above detailed piping/ducting stress analysis or by using semi-automated calc's, carry out ps structure calc's to BS5950, AISC, EuroCode and good engineering practice. Calculation to the following Codes: ASME/ANSI B31.1, B31.3, B31.4, B31.8, BS 806, EN BS14161, IP 6, API 6, 16 & 17, IGE/TD/12 Edition 2, Norsok, DnV, Lloyds and misc. Standards and Rules. Analysis & calculation software used: Caesar II, FeSafe (creep-fatigue), NozzlePro (nozzles, p. shoes, clamps, etc. ), AxiPro (flanges), extensive MathCad and Excel spread sheets and other software. These software have invariably proven themselves time an again in shortening the design phase and benefiting our clients with cost-effective engineering solutions. Drafting software: Autocad, Solids Works, etc.